Technology has transformed the way we do business, receive healthcare, and communicate with our loved ones, yet close to 1 in 5 Americans do not use the Internet. Disproportionately from low-income and minority communities, these populations remain isolated from our digital society. EveryoneOn is a national nonprofit working to eliminate the digital divide by making high-speed, low-cost Internet service and computers, and free digital literacy courses accessible to all unconnected Americans. We aim to leverage the democratizing power of the Internet to provide opportunity to all Americans – regardless of age, race, geography, income, or education level. Nearly one-third of U.S. households (32 percent) lack broadband service. Low-income and minority Americans disproportionately find themselves on the wrong side of the digital divide. We’re working with Mercy-Douglass Human Services Affiliate to provide you with the best low-cost Internet service and computer offers. Characteristic of Householders: Percentage of Households with no Internet Access at home. 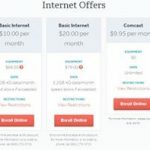 STEP #3 – Review and select the Internet Package you would like!